We just bought this Breitling Aerospace with all Box and Papers ref. E79362 from the original owner who bought it in 2007. 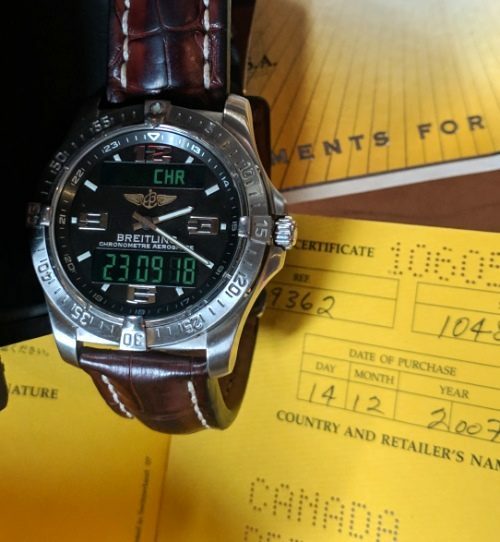 This BREITLING has both an anologue and digital display is a very attractive green LCD. The watch was barely worn and is like new. The Titanium case measures 42mm. All functions are perfect. The original BREITLING band and buckle also look great. The overall condition is like new and we priced it EXTENSIVELY lower than anyone on the net! Many of us vintage watch lovers really enjoy this watch as a “weekend” or travel watch. Act Fast. This price is ridiculously low for a quick sale.